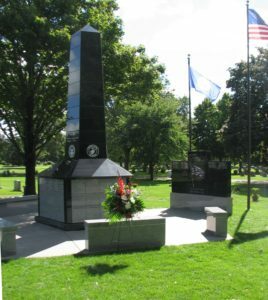 The Veterans Memorial, located near the middle of the cemetery adjacent to the Soldiers’ Rest area. Erected by Eickhof Columbaria of Northern Minnesota, the memorial is a unique design incorporating a pentagonal central feature that can serve as a resting place for as many as 710 cremated remains. The obelisk is seventeen feet high and is faced in black granite engraved with the emblems of all five branches of the U.S. military. To the immediate south is a new memorial stone that can display the names of veterans as a way to thank them for their service. We are very pleased with the precision and outstanding quality of the work that has gone into the construction of this Memorial.